A total of 422 permanent plots were established throughout Lake Simcoe watershed beginning from June until August 2017. Field sampling was conducted by University of Toronto field teams, in partnership with the OMNRF, consisting of seven crews of two. Sampling captured nineteen different subwatersheds including Barrie Creeks, Beaver River, Black River, East Holland, Georgina Creeks, Georgina Island, Hawkestone Creek, Hewitts Creek, Innisfil Creeks, Lovers Creek, Maskinonge River, Oro Creeks North, Oro Creeks South, Pefferlaw River, Ramara Creeks, Talbot River, Thorah Island, West Holland, and Whites Creek. The only subwatersheds not sampled in 2017 were Fox Island and Snake Island. Data from the VSP network are being used to derive several indicators of terrestrial ecosystem condition. Of these, six to eight indicators are included in the calculation of a composite measure of ecosystem quality, depending the habitat type being examined (i.e. forests, wetlands, or other natural vegetative cover). The criteria are 1) floristic quality; 2) weed index; 3) aboveground biomass; 4) dead aboveground biomass; 5) forest regeneration; and 6) vertical forest structure index. Forest classified by successional stages. 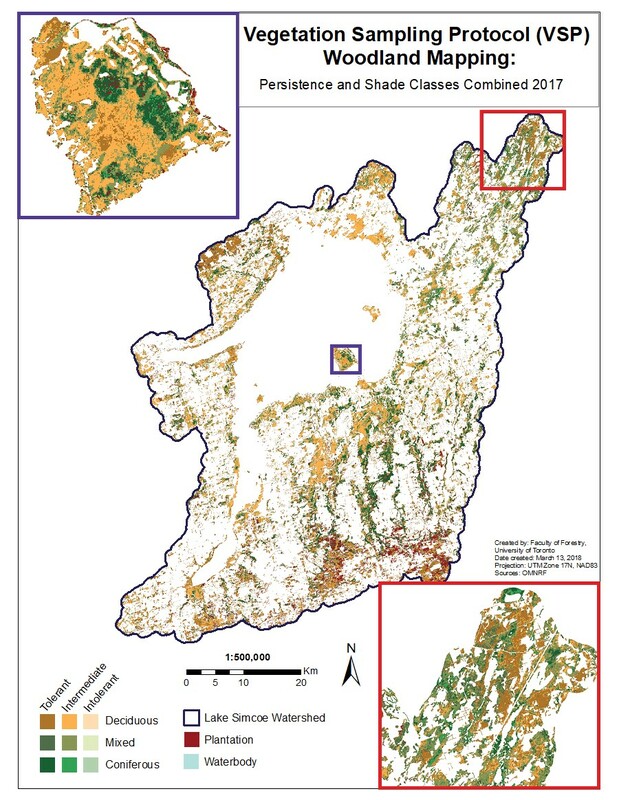 Biomass, carbon and CO2 are derived for each of the mapped forest classes. 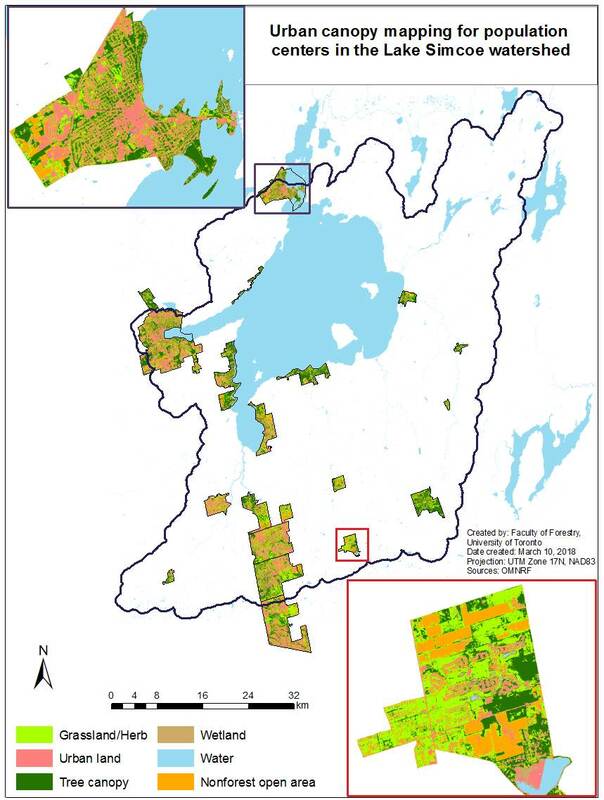 Urban canopy mapping for population centers in the Lake Simcoe Watershed. 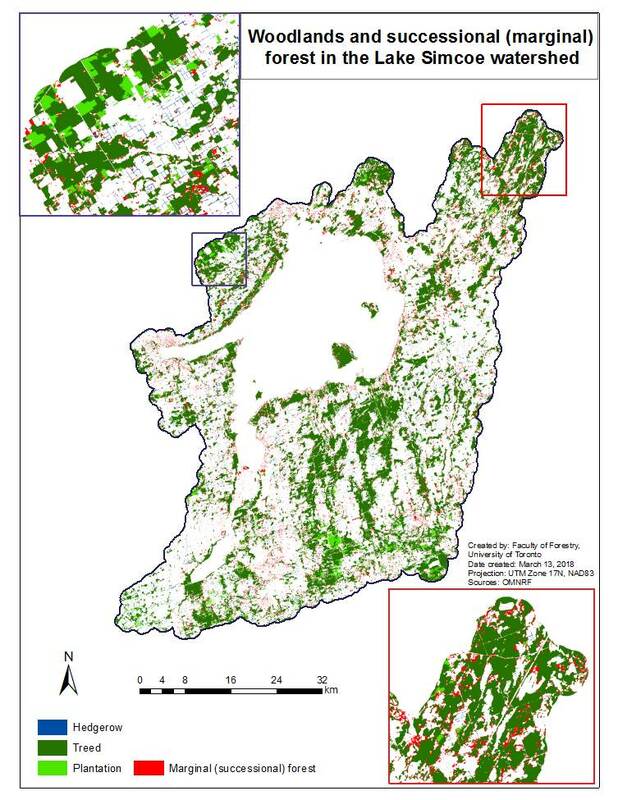 Early successional forest mapping in the Lake Simcoe Watershed.